We wrote an opera in-house. We auditioned to find the perfect cast, we hired the best musicians, we rehearsed it, we built sets, we publicized it and it emerged and it shined! But that was months ago. What have we been doing in the mean time? Well first of all we RESTED because we are not only premiering new operas but building a company and we bit off a lot. Not more than we could chew, but we had to spend the whole Summer chewing! Yum. Delicious opera dreams manifesting. Oh! And over the Summer Annie and her partner Justus built a rehearsal space with their own two hands (Annie’s dad helped too), a place for the larger company to hone and practice. This next season expect a house show, and hear updates of something new that Eric is building called Yoga Vox. Welcome to our Fall. Flour Salt and Moonbeams a Smashing Success! Hungry Opera Machine premiered Eric Stern’s opera, Flour, Salt and Moonbeams, along with a live action silent film by Annie Rosen March 27th, 2015 At the Alberta Rose Theater. Annie Rosen directed the opera. Critical accolades followed including reviews from the Oregonian. Read them on our PRESS PAGE. To listen to the opera CLICK HERE. Hungry Opera Machine at the Alberta Rose! 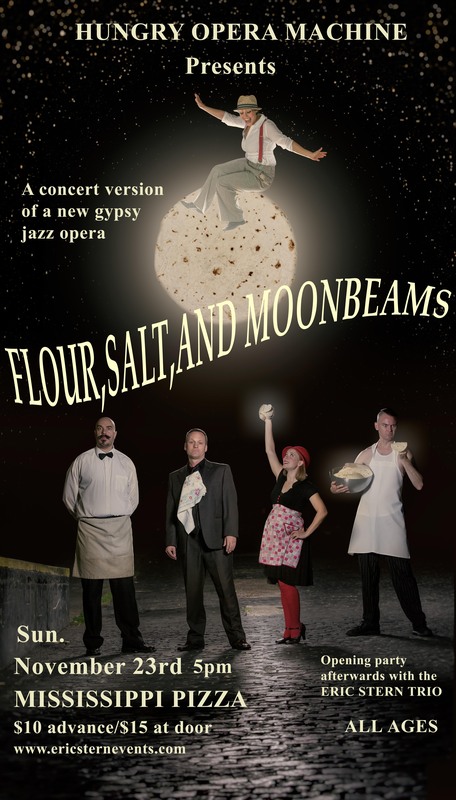 The fully staged version of Flour Salt and Moonbeams has been CAST. Joining Annie Rosen and Noah Mickens who premiered the concert version in lead roles will be Dru Rutledge and Ian Ramirez. Let’s meet them shall we? Soprano Dru Rutledge is a Portland, Oregon based singer who is in demand across the United States for her “rich-voiced tone” and “vocal fireworks”. A sought-after soloist, she performs this season with the New World Symphony in Miami for Pulse: White Out the New World Symphony, the Oregon Symphony for the Oregon Premiere of Distant Worlds, and as soloist for BodyVox’s Body Opera Files. 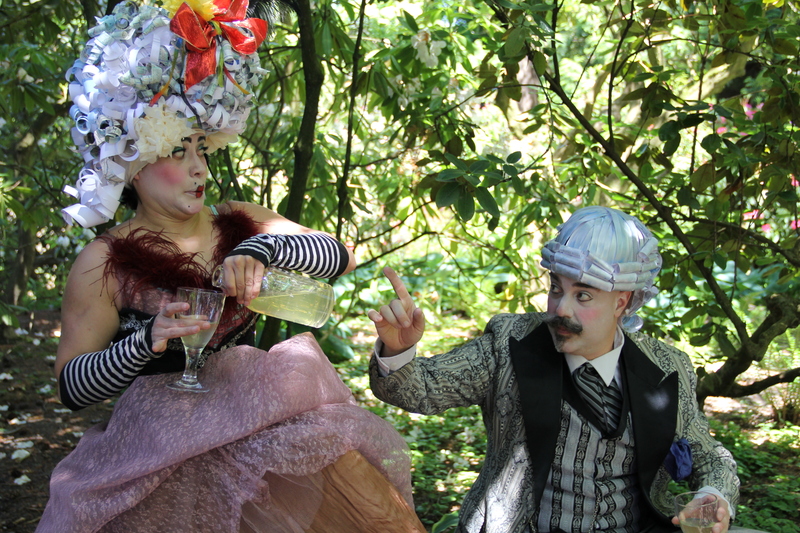 A frequent performer with Portland Opera, Dru has been seen as Papagena and the Queen of the Night in The Magic Flute and the Mother in Hansel and Gretel with Portland Opera To Go, as well as mainstage performances in Lucia di Lammermoor, Falstaff, and Turandot. pleasantly warm, spinning light tenor sound,” Ian José Ramirez has already established himself as a fine musician and dynamic actor. During the 2013-2014 season, he joined the Portland Opera Resident Artist program, where he sang the roles of Second Jew in Salome, Arturo in Lucia di Lammermoor, and Man with Old Luggage in Postcard From Morocco. Next season, he returns to Portland Opera for their 50th Anniversary Season to perform Dr. Blind in Die Fledermaus, Le Remendado in Carmen, Pete in Show Boat, and Sellem in The Rake’s Progress. Mr. Ramirez has received awards from the National Opera Association, the S. Livingston Mather Scholarship Competition, and the Orpheus Vocal Competition in Murfreesboro, Tennessee. 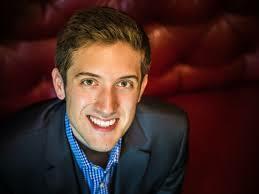 He has been a Young Artist with Opera Saratoga, Central City Opera, Indianapolis Opera, and Dayton Opera. Finally our new addi tions also include Vagabond Opera’s very own Drew Nelson! Sprung from a long line of musicians, the one thing he has always known is he is a musician, a performer, and self proclaimed band nerd. 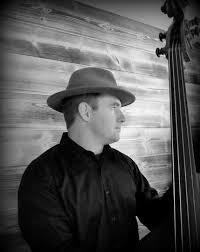 As a classically trained upright bass player with a degree in musical performance, Drew spends his days honing his craft, studying Jazz music, writing, and teaching music to people of all ages. In his off time he enjoys a hearty Yoga practice, slack lining, spending time with family and friends, and being in any place defined as Wilderness. Rehearsals are in progress for the exciting premiere at the Alberta Rose Theater March 27th and 28th! Get tickets here for Friday’s show and here for Saturday’s show! HOM premiered the concert version of Flour, Salt and Moonbeams on November 23rd. The fully staged performance will be at the Alberta Rose Theater March 27th and March 28th. Hear Annie and Eric talk HOM on the radio here. What happens when a diner cook who can only make tortillas (the most delicious in the world) encounters a mafioso customer who only wants his corned beef-hash? And what about the waitress with a mouth like a sailor and her money-grubbing boss? 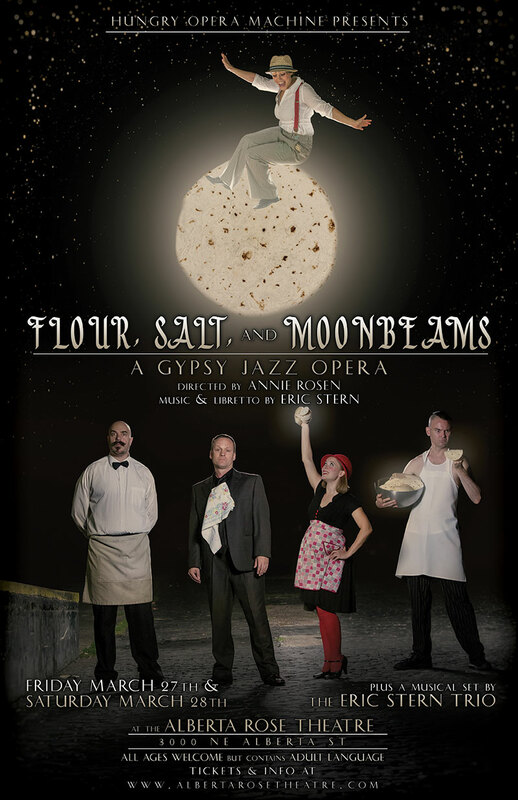 Come and see as Hungry Opera Machine (Eric Stern of Vagabond Opera’s newest endeavor) presents FLOUR, SALT, AND MOONBEAMS at Mississippi Pizza November 23rd in a very special concert version of this new opera with vocalists Catherine Olson, Scot Crandal, Annie Rosen and Noah Mickens. Instrumentalists Paul Evans on saxophone and percussion, Mirabai Peart on violin and Eric Stern on piano. The style of the opera is a hybrid of modern classical and gypsy jazz (the form of music popularized by Django Reinhardt) and the ensemble members will even take solos. Not what you think of when you think of opera is it? One thing it definitely is–An opening PARTY so there will be a jazz trio the second hour, led by Eric Stern, and prizes worthy of a Roman God. The opera, composed by Eric Stern is directed by Annie Rosen. 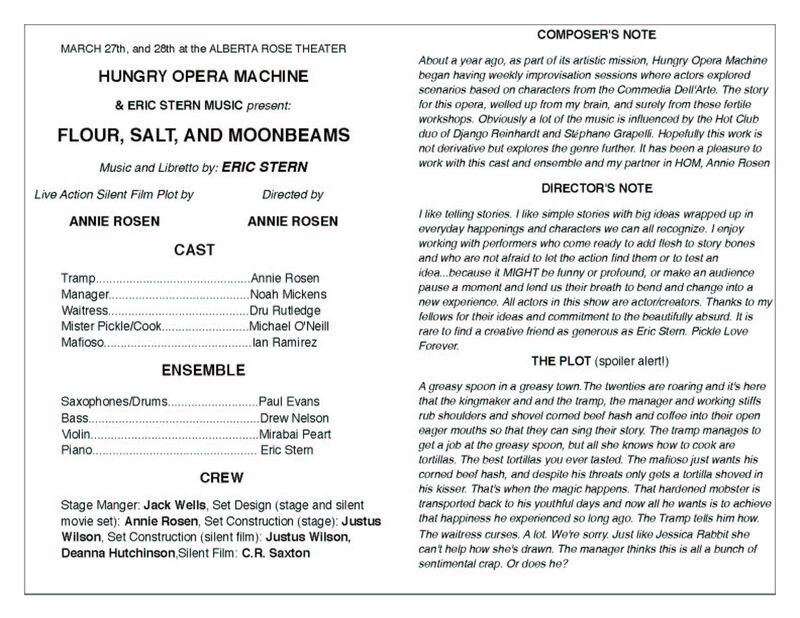 Hungry Opera Machine was founded by Vagabond Opera leader Eric Stern with the mission “to produce contemporary opera and theater in English casting primarily from the talent pool of the Portland Oregon community and the Northwest. 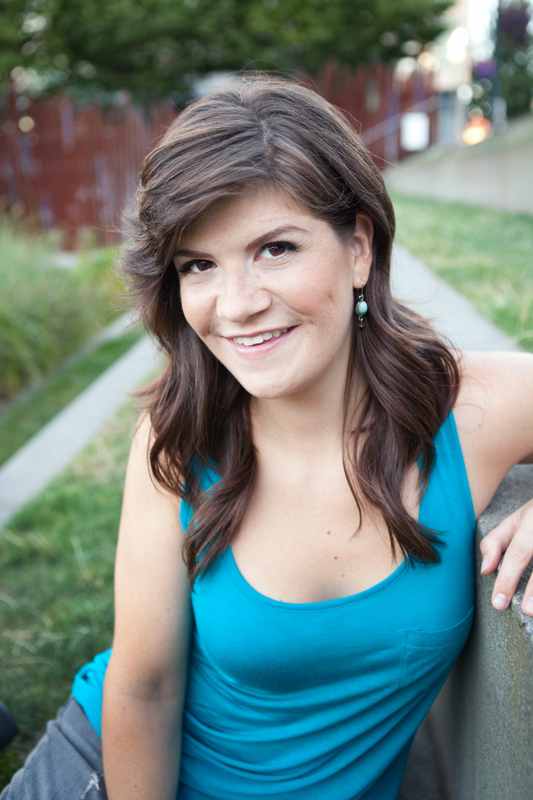 To extend the operatic tradition by choosing operas that not only conform to the classical standard but also ones that may include other forms of music such as jazz and music from everywhere.” In early 2014 Stern partnered with Dell’Arte School of physical theater graduate Annie Rosen in the endeavor. The partnership has been a crackling success. Already they’ve worked in collaboration with some of Portland’s premier artistic organizations including Artspark, Portland Story Theater, Night Flight Aerial and more. Opera and Commedia Dell’Arte. Together again after all these years! 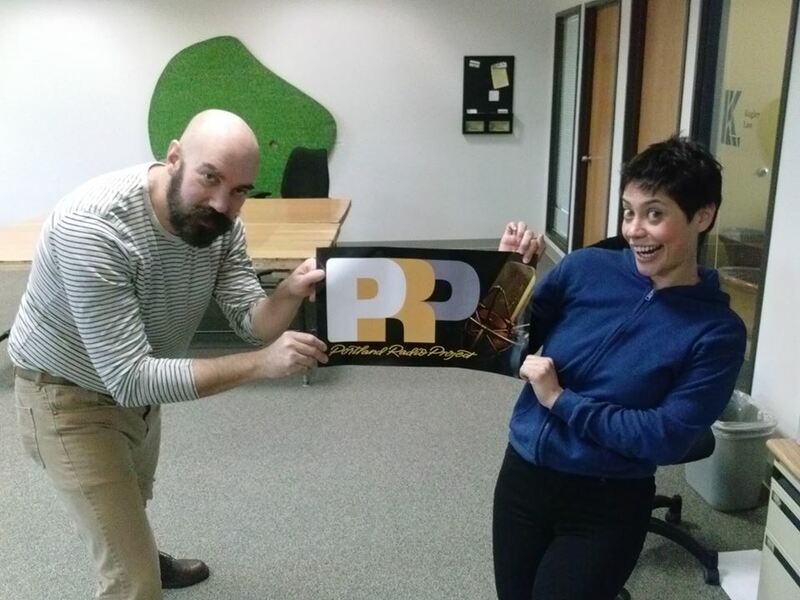 Collaboration: Portland Story Theater, Night Flight Aerial and More! 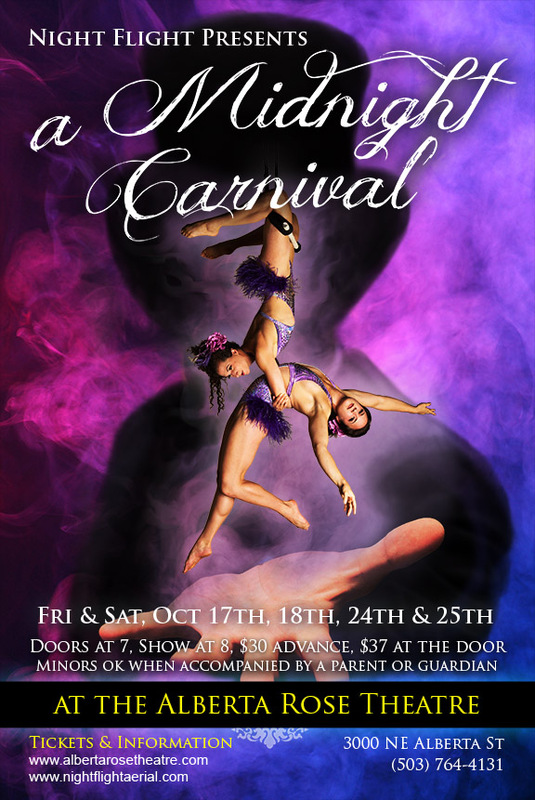 In October HOM’s Annie Rosen Directs Night Flight’s Midnight Carnival. For the past five years Eric Stern has worked with Night Flight (it’s how he and Annie met) and this year Annie has written the show and she and Eric will compose music and perform. Inside the Carnival your dreams await! Step right up, skip the fine print, and then sign on the dotted line. Night Flight is excited to present ‘A Midnight Carnival’ created in collaboration with the brilliant comedians and vocalists from the Hungry Opera Machine. Join zanies Faustidiata the Rat, Ivan the Mouse, and a cast of beautiful and mysterious acrobats, aerialists, and dancers as they unravel the dark secrets behind the hottest ticket on the midway. Let us sing, fly, bend, and tumble you into a world of magic and the unexpected…this show is sure to bring out the devil in you! Hom’s First Show a Smashing Success! Hungry Opera Machine is starting small and mightily. We had our first above-the-radar show chez Stern On June 7th. We began with a sing-along (you can read more about that), showcased new work and then launched into the comedic piece that Annie Rosen, Catherine Bridge, and I, Eric Stern, have been working on. Why a success? Because we managed to create an intimate lovely affair where people felt like they were part of a special little jewel box, outside, with lights hanging and torches blazing. Because we showed that opera can be small-scale and hilarious and could include the whole audience singing. Magical! Play Dates, Premiere’s and a New Opera in the Works. Hi, this is Eric Stern, Artistic Director for HOM. I am very pleased to announce that HOM had it’s first official, very under the radar, premiere of new work, this past New Years Eve. It was a performance that came out of the work that Annie Rosen and I have been doing together weekly: we meet at a performance space (The Lotus Seed in NE Portland) and workshop improvisation and Dell’Arte Clown exercises. It was a smashing success and we’ll post video soon. A Princess and a Mountebank Seek the Semperfittin’ Lily and more! An evening of New Works by Portland’s Brand new Opera Company showcasing new work by Eric Stern, Annie Laurie Rosen and Catherine Bridge. Also in the oven is a new opera I’m composing in the Gypsy Jazz style as well as upcoming classes taught by Annie and myself. Keep checking back for more info! Annie Rosen partners with Hungry Opera Machine. Hello this is Eric, founder of Hungry Opera Machine. I am very pleased to announce that I will be partnering with ANNIE ROSEN in much of my work at H.O.M. It has been my pleasure to work with Annie now for the past year in many projects including Night Flight Aerial as well as Vagabond Opera. Annie is a graduate of Dell’Arte School of Physical Theater and also has a degree in Story Telling. We’ll be hatching lots of plans soon including a LAUNCH PARTY sometime in February. Emerging from the emerald twilight of Portland Oregon, sepiatonic troubadour Eric Stern, the Northwest’s own premiere operatic tenor, accordionist, pianist, composer and consummate showman combines forces with Karolina Lux tribal fusion style belly dance innovator, performer, and choreographer (2011 Breakthrough Fusion Competition Champion) to present SEPIATONIC, a rare pairing of burlesque theatrical bohemian vaudvilliany by two of the cabaret stars of the Northwest. in NYC, , throughout the Northwest, and internationally from Portland to Paris to Poland. Stern has appeared with Balkan BeatBox, Jason Webley, The Cherry-Poppin’ Daddies, The Decemberists, Devotchka, Rachel Brice, Unwoman, and many others. He is the founder of Vagabond Opera. Karolina Lux has worked with some of the most innovative, burlesque and vaudeville artists and companies of the time. Experience from work with such groups such as Vagabond Opera, Sinn Savvy Burlesque, Swing Time PDX, Wanderlust Circus, teachers of The Rose City School of Burlesque, etc., have given Karolina a cutting edge grasp of variety performance arts. Karolina has trained with internationally acclaimed stars and innovators such as Zoe Jakes, Suhaila and Jamila Salimpour, Kami Liddle, Mardi Love, and Rachel Brice.